The DMX-I-4308 printer, engineered with precision-built printer mechanism and state of the art electronics, is perfect for applications requiring very small labels, intricate graphics, or two-dimensional bar codes. The 300 dpi (12 dots/mm) printhead, coupled with the capability to accurately maintain critical print registration, enables the I-4308 to produce labels for applications such as small parts tracking and identification of wiring harnesses. 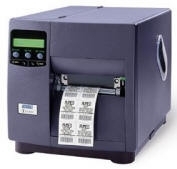 The I-4308 is also an excellent product for generating intricate DataMatrix or PDF-417 bar code labels. The die-cast aluminum frame and metal cover provide a rugged, reliable platform that stands up to the harshest industrial environments. With print speeds up to 8 inches per second (203mm/sec), the DMX-I-4308 won't keep you waiting for high-resolution labels. A field installable flash/font expansion card allows for storage of label formats, graphics, downloadable fonts and international language print capabilities, thus minimizing formatting download time and maximizing printer output.